What to do if You Get a Trojan Virus on Your PC? Just like any usual day, you're on your computer downloading some programs. All you want is a program that can help you with the small tasks you have, but then the program you ran on your computer is a Trojan horse virus. It started to change your settings and affect your computer system. What can a Trojan Virus Do to You? Trojans can work as a Spyware. It'll wait until you use your online accounts or enter your credit card details. Then, it'll send your passwords and other information back to the cybercriminal. Trojans also have the ability to change your codes or your security system. With that, even more malware can get through your security tools without getting noticed. # 3: Turns your endpoint into a zombie! Cyber criminals don't just steal accounts or information, they also pester other people using DDoS attacks. In order to do that, they'll implant Trojans into an endpoint and use it for their own interest. That will put you in great trouble as cyber crimes are detected through IP addresses of the endpoint. Your computer language suddenly changed without you changing it. It's a one of the symptoms of a Trojan. Your screen can also show back-to-front and other strange activities can tell you that you have an infected computer system. Computers aren't the only targets of Trojan horse viruses. It can also exploit smartphones to send expensive SMS messages to premium numbers. A cyber criminal can make money through this modus operandi. If you think that having too many files and running multiple applications all the same time can slow down the computer, it's not the only cause. A computer Trojan can also decrease the speed of your computer because it must be using many resources. So now you're asking yourself, "What to do if you get a Trojan virus?" Is it possible? Can you do it by yourself? Of course, there are two ways to do it. First, you can try to do it using manual methods. Secondly, you can try using a software to do the job for you. After recognizing a file infected with Trojan horse, it becomes easy to remove. Most of the time, your system will give you a DLL error, which is associated with the Trojan attack. You can copy the error and find out about the affected exe file online. If you forget this step, then it will restore the files you delete. When you restart, press F8 and then select safe mode to start your computer. You will find this in the control panel. Then, you can remove the programs affected with Trojan horse. To delete all files of a program, you should remove them from Windows System folder. When you have successfully done the provided procedures, you should restart your system in normal mode already. You can now use a Trojan virus free computer and just be extra careful next time not to be infected again. You need to display the hidden folders from the folder options. Then, you got to restart the system in safe mode. After that, you need to disable the processes that are associated with Trojan virus. However, to complete these steps, you will have to edit your system's registry. Can't stand doing manual Trojan removal? Even if the manual removal can help you save your computer, technical computer settings might not be your best skill. So now, what can help you is the specific Trojan horse virus protection that can eradicate such pesky Trojan horse virus in the computer. 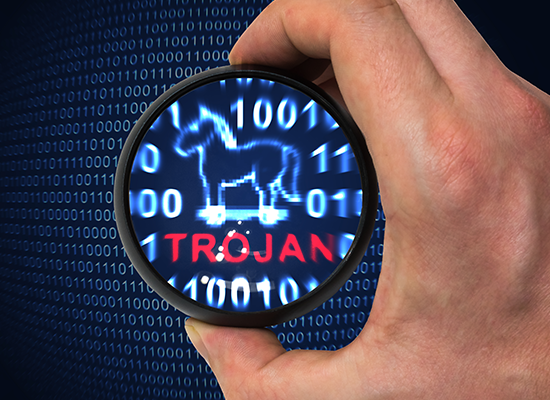 All you need is to use the Advanced Endpoint Protection to fight the Trojan horse virus symptoms. It is the next-generation cyber security solution that blocks bad files and automatically contains unknown files in a virtual container using Default Deny Platform™ and containerization technology. The unknown "contained" file is analyzed and an accelerated verdict is obtained through the Valkyrie cloud-based advanced malware analysis platform. It gives you the Trojan horse virus protection. Comodo Advanced Endpoint Protection gives a lightweight, scalable Default Deny Platform with a unique endpoint security approach. This results in complete protection and enterprise visibility. The app-based platform removes the difficulty in using and solving the issues. Provisioned in minutes, Advanced Endpoint Protection also contains unified IT and security management console, that through an app-enabled platform reduces the effort of managing your Android, iOS, OSX, Linux, and Windows devices, on every segment of your physical and virtual networks.